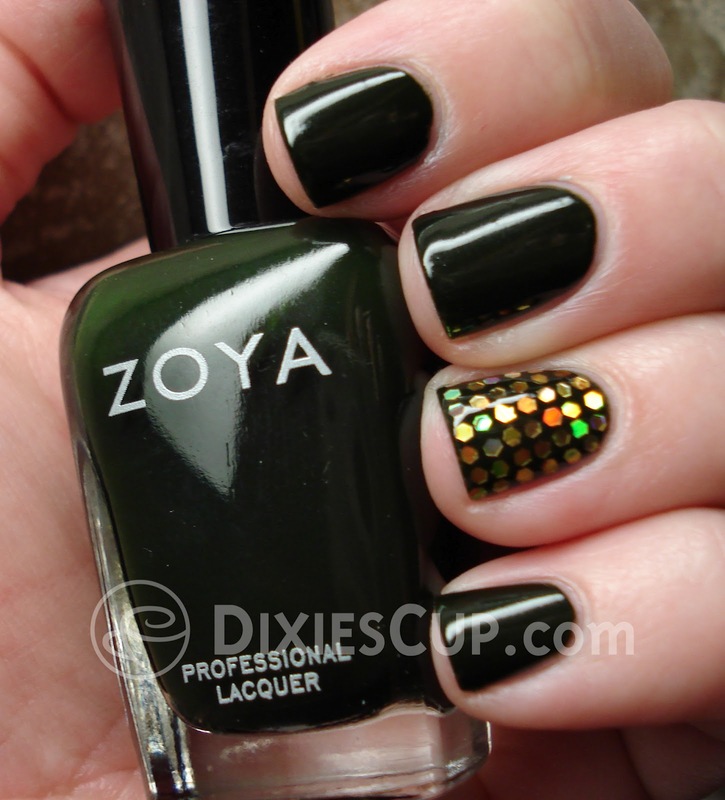 Above is a photo of one coat of base coat and two coats of Zoya Envy. There is no top coat. Also, I tried out something new on my accent nail. Well... it's new to me. 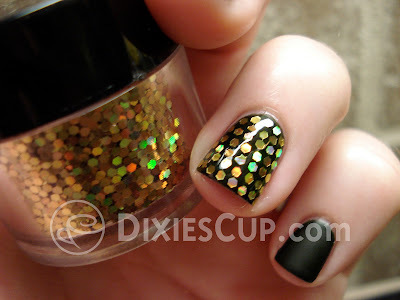 The first person I ever saw use this technique with loose glitter is Sam on The Nailasaurus. She is VERY good at nail art... you should absolutely check out her blog. The first time I saw her do a fingernail with glitter like this, my jaw dropped. Not only is it super gorgeous, but it looked like a tremendous undertaking. I mean... WHO actually takes the time to place loose glitter on a fingernail one-by-one until the whole nail is covered? Apparently Sam does, and once she did a tutorial on how she does it, I realized I could too. And it doesn't take that long! It took me a total of 2-3 minutes, which I think is quite fast. Per my husband's suggestion, I added a coat or two of Hard Candy's Mattely In Love to the nails without the glitter. He is typically very helpful when I am trying to be creative, and this time was no different. It was a nice touch for sure. HOWEVER, I was reminded how much a matte topcoat can shorten the life of a manicure. :( The glitter nail could have lasted for quite a while, but the other nails started showing wear within a day. I purchased this glitter along with some other nail art supplies from The Born Pretty Store. This is where Sam from The Nailasaurus purchased her glitter, and I wanted to get the same stuff she used. PLUS... that pot of glitter only cost me $2.38. And although this store is located overseas, the shipping is free. Although I was disappointed with the shade of the polish, I think this is one of my favorite manicures so far. I'm impressed with how the accent nails turned out and I will definitely be using this technique a lot more. I hope you enjoy! I LOVE that Zoya even if you don't. Thank you, Sam!! 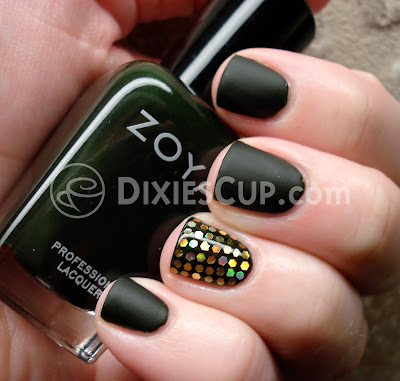 I DO like the color, I was just disappointed because I purchased it thinking it would look more green and less black. I know what you mean, I have a similar colour from Sinful Colors and it stains like a bush too. Big let down. This is my favorite by far. LOVE IT!